First time tasting our pretzels? Watch out, you're going to be hooked! Our products are hand-rolled and baked in small batches using only the freshest ingredients. 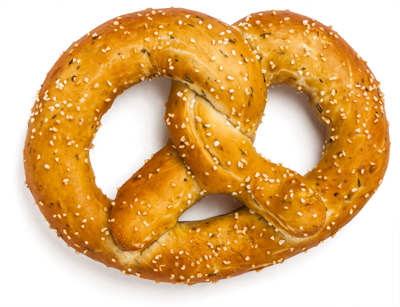 Check out some of our products below; you'll be surprised by the pretzel possibilities. We can even make custom products. Go ahead, let your imagination run wild. 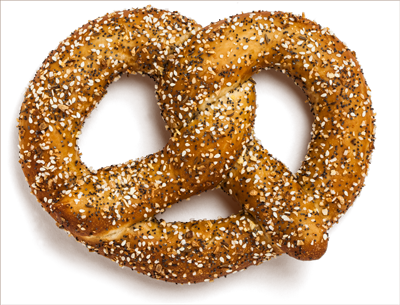 Our pretzels are crafted in a variety of flavors to satisfy every taste bud. 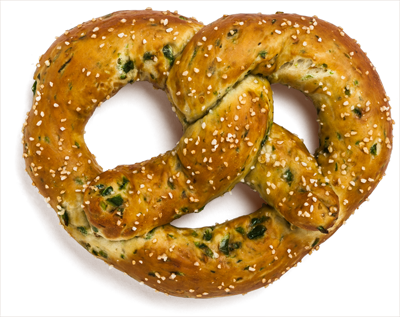 These yummy savory pretzels are perfectly paired with a salad or your favorite bowl of soup. 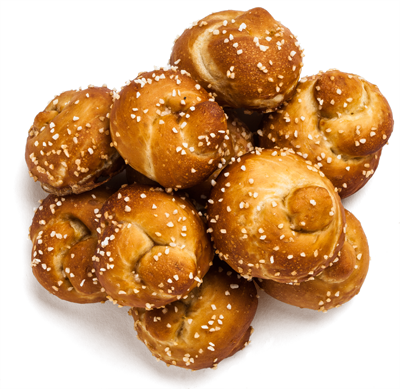 Pretzel Bites are absolutely perfect for parties since they come in quantities of 60. Keep 'em in the freezer and warm them as needed. Better yet, save some for personal snacking - you'll be happy you did. 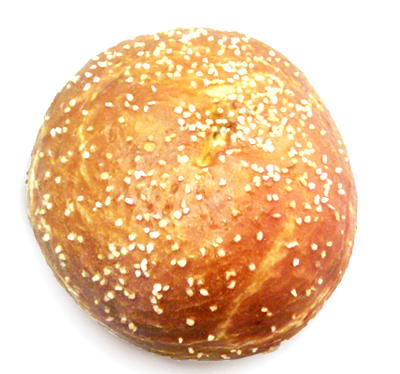 Upgrade any plain ol' sandwich or burger into something special with our pretzel buns. There are 8 buns per pack, perfect for your cookout. 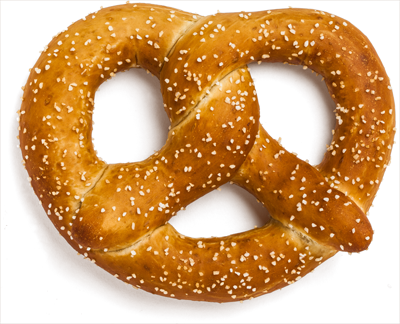 Our Original pretzel is anything but "plain." It's the perfect amount of chew with a little bit of crunch, and it's topped generously with pretzel salt. It's amazing how buttery these taste - without the butter or other animal ingredients. Five simple ingredients sure tastes good! 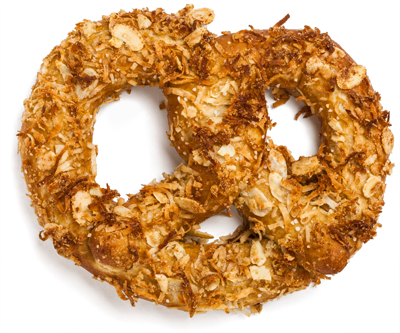 Better than an Everything Bagel, it's an Everything Pretzel. This guy is loaded with sesame seeds, garlic, onion, caraway seeds, poppy seeds and salt. Ok, ok, you might need to brush your teeth afterwards, but it's totally worth it! There are no canned jalapenos here! Nothing but fresh, chopped jalapenos are added to this dough to create the perfect amount of heat. Need more spice? Pair it with our Southwestern Cream Cheese or cool it down with plain ol' cream cheese. Want more sandwich, but less bread? Try our Thin Buns. Since they're the size of English Muffins, they compliment your sandwich fillings without weighing you down - perfect for a light meal or a quick snack. Nothing like a little salt to go with some sweet. 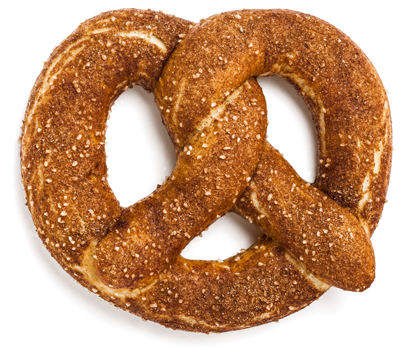 Our Cinnamon Sugar pretzel is made from the same dough as the Original pretzel, but it's topped with cinnamon, salt, and brown & white sugars to make a unique, special treat. Check back often for new flavors as we're always experimenting in our kitchen. Want big flavor but have a small appetite? 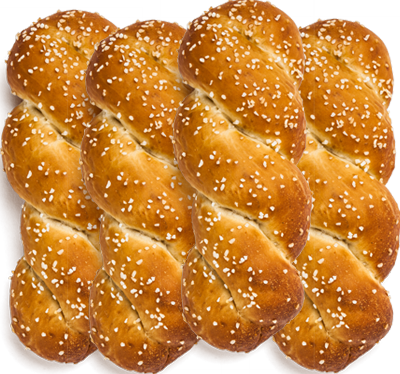 Our pretzel twists are perfect for you. They are available in the same flavors as our pretzels, but they are about 1/5th the size. These little guys are packaged in quantities of 30 can even mix and match flavors by purchasing a sampler pack. Coconut lovers, rejoice! These pretzels have the perfect amount of crunch with toasted coconut, almonds and brown sugar. We throw in some salt to give you the perfect treat. Upgrade any plain ol' dog or bratwurst into something special with our pretzel buns. There are 8 buns per pack, perfect for your cookout. Mmm...fresh chopped rosemary and garlic drizzled in olive oil and rolled into a pretzel. What's not to love? With more than 50 different flavors, you're sure to find something you'll like. By purchasing assorted packs of pretzels, bites and twists, you can try a few flavors each time. Please note: (*) indicates no animal products. Pretzels and twists are available fresh daily. Larger orders, bulk orders and specialty items require advance notice (indicated below). Since we bake pretzels fresh daily, our flavor offerings are always changing, expanding and revolving - what is created in the morning may not be produced later in the day. Check out our complete list of flavors to see all the possibilities or contact us to suggest a new flavor.